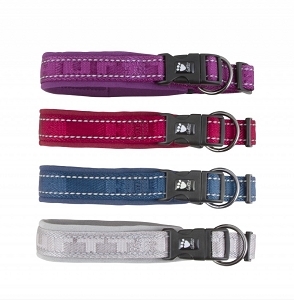 The Dazzle dog collar is a great collar for everyday use. Wide and softly padded for optimal comfort as well as strong and durable. The design ensures the pressure is taken off the plastic snap buckle for safety. the powerful reflectors will be caught by passing traffic and light up to allow your dog to be seen at night. 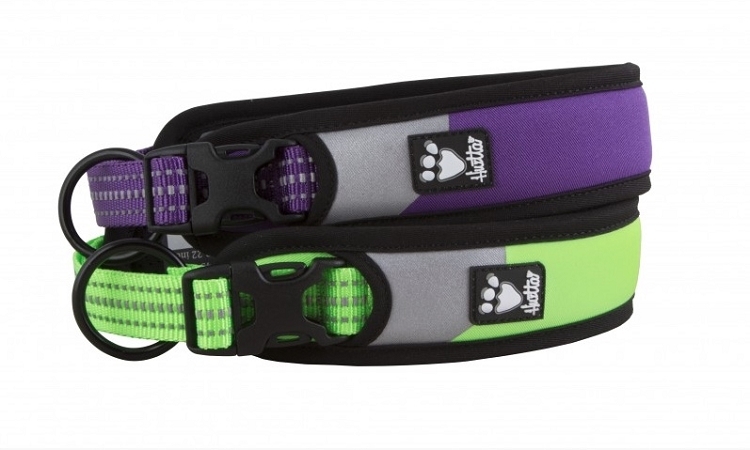 Available in the new Lupine (Purple) and Kiwi (High Visibility Green) colors in 4 sizes. I find that these collars run a little small so I would size up. My dogs neck is 16" and size 14"-18" is adjusted all the way out, which means the padding doesn't cover the whole collar. Hurtta Adventure Dog Collar - Shadow 18"-22"